Read through these RV reviews to help you choose an RV for Full Time Rving. There are a lot of things you need to consider to narrow down your options and decide which RV will work best for you. All full time RVers' have their own unique lifestyle, so you'll want to do your research to determine what kind of an RV will be right for you and the RV lifestyle you want to create. It's so fun shopping for a new RV, but there are so many choices it can be mind boggling. We recommend you visit these websites and request their brochures. DonÂ’t be shy! Get yourself a real stack of these brochures and compare features and construction differences until youÂ’ve got a real feel for whatÂ’s available. This is a great way to decide what you really want in an RV and what you can probably live without when you buy one. Read the RV reviews and see which ones fit your needs. The company was started in 1958, but the name was changed to Winnebago Industries Inc. in 1960. The company was producing travel trailers until 1966 when the first Winnebago motor home rolled off the assembly line. The Winnebago Rialta Motor Home was built as an alternative to the larger Class A motor homes and the conversion vans. It has an aerodynamic design and a mere 20 feet 8 inches in length; making it exceptionally easy to maneuver. Airstream began producing their lightweight travel trailers in 1931. They design their trailers to be handed down through generations of families, and after almost 80 years of building their environmentally friendly trailers nearly 70% of them are still on the road today. The current models continue the tradition of extraordinary design and hand-crafted quality that makes Airstream world famous. Our RV reviews show Airsteam travel trailers are perfect for casual travel or full time RVing. PanAmerica - 1 floorplan that includes a ramp and garage area 35' in length. Victorinox Special Edition - 1 floorplan, only 19' 2" and 4,500 lbs. The new Airstream motorhomes are easy to drive, maneuverable and very convenient. The compact Interstate Class B motorhome is designed to drive like a luxury vehicle & includes amenities you'll love. Learn more in our RV reviews about these recreational vehicles that are suitable for full timer RVers. The Interstate Class B motorhome is a great solution if you don't want to tow a trailer or don't want a full-sized motor home. Exceptional maneuverability, easy to drive, with a bathroom, galley, entertainment center, and storage space. Although there are no hard and fast rules to the best RV for fulltime RVing there are some details that will make your new RV lifestyle more enjoyable. The wonderful light weight Burro travel trailers are made of a double shell construction with foil backed fiberglass insulation between the inner and outer shell providing protection from moisture and temperatures. A small RV can be used for full time rving if you buy RV right. The aerodynamic design of the lightweight and durable Casita trailer built since 1983 makes these small travel trailers an American favorite with easy towing, quality construction, and great interior. Read our RV review of this lightweight trailer. A Scamp RV is economical, aerodynamic, easy to tow, maneuverable, compact, convenient, easy to setup, dependable, adaptable to temperatures, and built to last. The perfect RV for a Full Time Rving couple on the go. Truck bed campers are efficient, well-designed, highly maneuverable and extremely comfortable for one or two persons. In most states insurance on small truck campers will be far less than a motor home and somewhat less than if you buy RVtravel trailers. Selecting a small camper trailer that is easy to tow and aerodynamic will provide high fuel efficiency. These light weight travel trailers are very easy to maneuver. Their compact size makes getting into RV spots easier. Many of these small RVs can be towed by small cars, SUVS, mini vans, or a small truck. Pop up campers also called a tent camper, or folding camper, are easy to setup, easy to tow, easy on your wallet, and easy to maneuver in a small campsite. Read the RV reviews to learn how some full time RVers' use these campers to live a frugal lifestyle. A motor home vs. fifth wheel which should you purchase for full-time Rving? 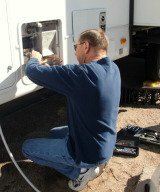 There are many people who wonder about the facts when it comes to a motorhome vs fifth wheel showdown. You long to experience the excitement of the open road but you want a vehicle that will provide you with comfort, safety and convenience. Choosing small motorhomes for Full time Rving can be challenging, but a small RV does have some advantages over the larger and longer ones. Let's look at some of the options for small motorhomes and the pros and cons of each choice then buy RV. In addition to RV reviews we've put together some articles to help you evaluate your options and make the right decision when choosing a rig for full time RV living. In addition to these articles you may want to check out some RV magazines and buyers guides, RV shows, request manufacturers brochures, and read about what works for other full time RVers. When you begin your RV search remember there are no rules when it comes to selecting an RV for full-time living. There are however things that will make living in one more comfortable and enjoyable. Help for selecting the best RVs for full timers. What RV type is right for you? Before you buy or rent an RV, it pays to gain a basic understanding of how RVs are categorized. RV rentals are a great way to see if Full time Rving might be right for you. Before making the commitment to buy RV you can rent a variety of models and decide which model will work best for your lifestyle. If youÂ’re in the market for an RV than RV Shows are a great place to view a lot of different brands and manufacturers before making a purchase. These shows give you the opportunity to Â“try it on for size.Â” You can browse the different models, dealers, manufacturers all in one convenient location. With the current economic conditions getting RV loans today can be challenging. Here are some additional things to consider before taking out that RV loan. Not having the right coverage is a common occurrence. You donÂ’t want to find out too late that your RV insurance isn't sufficient. Get more than one RV insurance quote before deciding. With all the terms involved when it comes to towing a vehicle, itÂ’s easy to get confused. If you are getting into towing for the first time, knowing and understanding these terms will give you a better and more stress free towing experience.